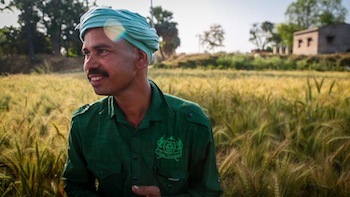 Sumant Kumar, a farmer in India’s Bihar State, recorded a world-record rice yield in 2012 using a method known as the System of Rice Intensification. He has applied the same techniques to his wheat crop. Photo by Sam Eaton. The latest batch of “What’s for Lunch” stories on PRI’s The World highlight farming methods that don’t bust the global carbon budget. On July 25, Sam Eaton reported from northeastern India on the System of Rice Intensification, which uses less water and fewer chemicals than conventional farming. The method has been spreading not just among rice growers, but also among producers of wheat and other crops. Still, some scientists are skeptical. On July 15, Bianca Vazquez Toness met farmers in central India who are using human waste to fertilize their crops. Sewage contains high levels of valuable nitrogen and phosphorous, and putting it to use seems like a no-brainer: synthetic nitrogen is a major greenhouse gas polluter, phosphorous is increasingly scarce, and waste disposal is an enormous challenge in the developing world’s fast-growing cities. But human waste harbors dangerous microbes. The trick is to find ways to process and spread it without endangering consumers’ or farmworkers’ health. On July 8, The World’s Mary Kay Magistad visited a Chinese inventor who has created what he believes may be the world’s most efficient irrigation system. China’s aquifers are in serious trouble; if farmers can radically reduce their water consumption, the country won’t need to import nearly as much of its food. If these issues interest you, check out a post by guest blogger Shane Bryan about why can’t-miss technologies sometimes fail to catch on.